The nice Nantes is always fun and exciting stop for its culture and architecture, but the city also tasted through its atmosphere, its terraces and restaurants here mingle the flavors of the sea, but also terroir. This is the Loire-Atlantique! Among the many tables Nantes, we have kept only 10, the best in all categories. 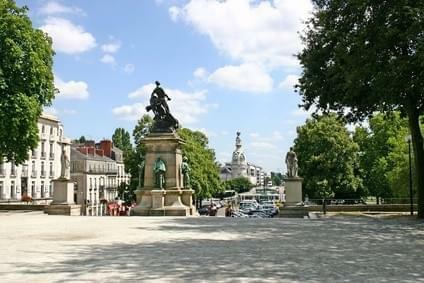 It is in the historic heart of Nantes, opposite the Opera House, which is one of his most famous restaurants. La Cigale, in a classified area, serves so chic and cozy brasserie. Do not miss: the plateau de fruits de mer . Here is an address that has built a reputation in Nantes. Just like the city, the U.Ni features a modern atmosphere and a contemporary kitchen, which goes well beyond the traditional framework of the gourmet restaurant. A test. We went there for lunch or dinner, for the quality of food as well as for the good atmosphere. In the center of Nantes, the Canclaux typically offers a varied bistro menu with the reception and nice terrace to match. dde neighborhood restaurant with one of the very best value for money Nantes. Perfect for lunch, Cocotte welcomes you with a menu where poultry is everywhere. tasty food and friendly service, hard to ask for more. Not far from the Place Royale, established in an old warehouse, is the Creperie Black Head. You guessed it, you can sample cakes and pancakes, delicious in the traditional Breton style. rigor bowl of cider. A perfect address for those looking to dine on the island of Nantes. Near the famous machines, the sign shows us where the kitchen of this restaurant: Turkey! Spicy and carefully prepared, all Turkish specialties to discover in the card. A very nice location, on the Loire waterfront, next to the stadium Marcel Saupin. Marcel Gateway is set in a modern building, with a beautiful terrace by the river, and serves modern and inventive brasserie cuisine. Prepare to be surprised, especially your taste buds. In a sober and very urban decor, Lulu Rouget experimenting with a cuisine that changes all the time, at the discretion of the head and products: suddenly, often returns never tiring ! The Transporter, we often stumble across, but then we keep it in his good books. refined and original cuisine, meat and fish, neat and pleasant environment, not to mention a welcoming and smiling service and full of good humor.